Below are tips on how to respond if you encounter some of the more common and potentially ferocious animals. Bears typically avoid humans, but if they perceive a danger to their young they can attack immediately. It’s never advisable to scream or run if an attack appears imminent. It’s best to speak in a monotone and slowly back away without making any sudden moves. If that fails, your best option is to drop face down into the fetal position and keep your throat, neck and face covered. Bears usually go right for the jugular or torso to expose vital organs, so keeping those areas covered is your only defense. Wolves nearly always travel in packs made up of an alpha male and several omega males, the latter being the ones you’ll be most likely to come up against. Never run from a wolf or pack of wolves – chasing is an instinct of all canines. Wolves are easily intimidated by a show of dominance, so stand your ground and wave your arms or a long object, such as a stick or rifle, to make yourself appear as large as possible. Yelling and throwing objects while doing this will probably scare them off. However, if directly attacked by a wolf, the best thing to do is wrestle it into a headlock, putting it in a chokehold. Once the wolf realizes you’re the alpha dog, it will likely give up the fight and run off along with the omega wolves. You’ll more than likely suffer some injuries, but many people have survived using this technique. 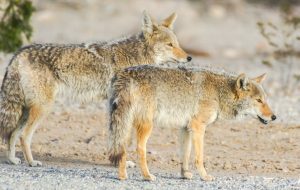 Coyotes also travel in packs led by an alpha member. Coyotes are quite a bit smaller than wolves, but don’t let that give you false sense of security. As with wolves, intimidation is your best weapon against a pack of coyotes. Rather than run, stand your ground, making yourself appear as large as possible while yelling and making motions of aggression. Attack by the alpha male is a rare occurrence, but fighting him into a chokehold will prove you’re dominant and the whole pack will likely run off. Bird attacks are rare, and they don’t occur as depicted in Alfred Hitchcock’s The Birds. However, flocks of crows, ducks and geese can attack, and individual swans and geese can also exhibit aggressive behavior when provoked or threatened. The best defense is to use an article of clothing to protect your face and eyes and find shelter. Most birds instinctively fly away, but can attack and cause significant damage. Birds will attack in flight from all different directions, which leaves you no option but to get yourself to shelter immediately. Larger birds, such as geese and swans, can be quite intimidating when threatened, and their bites can cause injuries. As tempting as it might be, do not turn and run and don’t yell or be aggressive. Instead, stay facing the bird and slowly back away, even if it follows you. These birds are territorial and will usually relax once you no longer pose a threat to the area. Raccoons can be very vicious when provoked or their territory is invaded. A rabid raccoon will also likely be aggressive. If attacked by one or more raccoons, never turn your back. Back off while facing them so they won’t chase you. Yelling and making loud noises will intimidate them, but always maintain eye contact. Racoons are cunning and will take the slightest opportunity to attack. If you are bitten or jumped on, it’s important to stay on your feet to minimize the attack and prevent bites to the face and neck.